Join SM’s latest promo in Cebu – SM Seaside City Cebu DOWNLOAD, SHOP & FLY and get a chance to turn your travel plan into reality. Ready your smart phones as SM continues to offer new and exciting ways to make shopping more fun and rewarding! 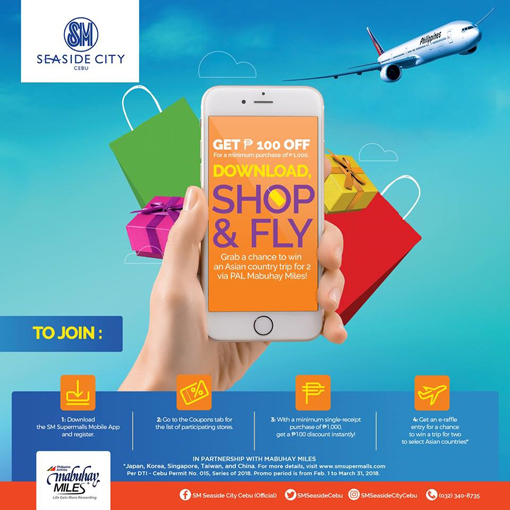 SM Seaside City Cebu DOWNLOAD, SHOP & FLY Promo is in partnership with Philippine Airlines and PAL Mabuhay Miles, winners will also be getting additional mileage points when they fly via this promo. 0 comments: on "Experience Asia with SM Seaside City Cebu DOWNLOAD, SHOP & FLY Promo"